The Campo dei Fiori Regional Park was established in 1984 and occupies a surface area of 5,400 hectares. 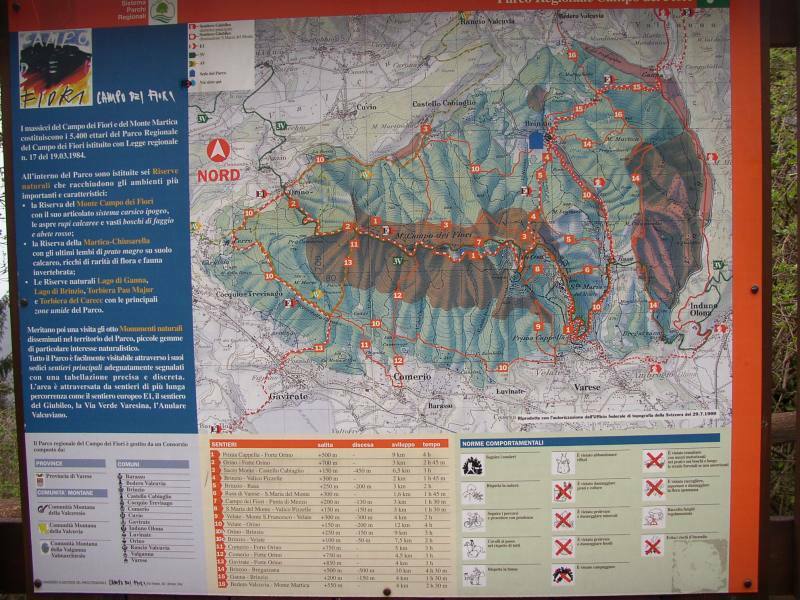 It comprises the Campo dei Fiori Massif and the Mount Martica Massif, which are separated by the Rasa Valley, which joins Cuvia Valley and Olona Valley. 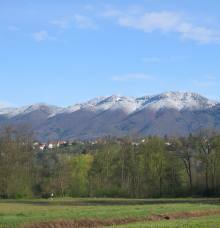 The park is bordered to the north-west by the Cuvia Valley, to the south by the city of Varese and to the east by the Ganna Valley. The park's official headquarters are in Brinzio, but the park is so close to the county town that it is one of its most important natural attractions. Nature reserves have been created within it, grouped according to their dominating characteristics: wetlands (Lake Ganna, Lake Brinzio, and Pau Majur and Carecc peat bog nature reserves), beech and spruce woods, karst systems (Monte Campo dei Fiori Reserve) and lastly, a local grassland formation called magredi with luxuriant flora (Martica-Chiusarella Reserve). 8 natural monuments stand out for their particular naturalistic interest, including the most renowned: little Motta d’Oro Lake, unfortunately in an advanced state of being filled in, and Pesegh Falls, Forre della Valganna, which are deep crags in the rocky walls, the well-known Brinzio glacial erratic and the Ceppo spring of karst origin. A favourable geographical position and peculiar geological properties have allowed quite a varied vegetation to develop here. The slopes are covered with broad-leaved trees, chestnut trees prosper up to an altitude of 600 m, along with ash trees, Sycamore maples, and lime trees in the wetter areas. Beech trees are higher up, while the dryer areas (Mount Martica) are characterised by Scots pine and birch. The limestone substrate favours the presence of dry meadows whose apparent monotony is broken by numerous varieties of wild orchids, including the Bee Orchid, fly Amanita and Gentiana pneumonanthe. In addition to butterflies, dragonflies and grasshoppers, the park’s woods are home to roe deer and deer and to other mammals and small rodents. Birds of prey include sedentary birds such as the Black Kite, European Honey Buzzard, Common Buzzard, Eurasian Sparrowhawk, Northern Goshawk and the Peregrine Falcon, and migratory birds like the Short-toed Snake Eagle and the Western Marsh Harrier. The large number of bats here convinced the EEC to finance a programme to protect them. The limestone ground and dry meadows are the ideal environment for the proliferation of invertebrates (lepidopterans, odonatans and orthopterans). Construction of the building started in 1956 but works were only completed 7 years later. The Cittadella delle Scienze della Natura dominates the park from its highest peak, Punta Paradiso. It is open year-round and has guest rooms capable of accommodating up to 30 people. Today, the complex (managed by volunteers) is the site of the Pre-Alp Geophysics Centre, L. e M. Zambeletti Park, R. Tomaselli Botanical Park and the well-known G.V. Schiaparelli Astronomical Observatory. Visitors have access to 9 telescopes on the panoramic terrace to look at the sky and its phenomena. The view from here dominates Varese and also spans past it, over the lakes (from Lake Varese to Lake Maggiore, including Lake Comabbio and Lake Monate), plain, and Alps.